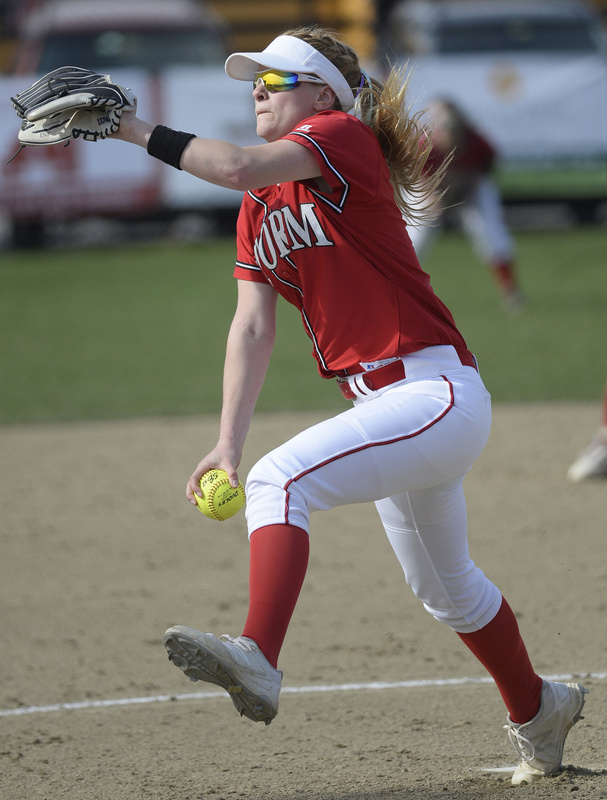 SCARBOROUGH — Scarborough’s softball team is well-known for its ability to pummel the ball, but Wednesday afternoon at the Kippy Mitchell Sports Complex, the Red Storm only produced a couple of loud hits. Instead, the Red Storm turned to their affinity for small ball and superb defense, as well as a solid start from pitcher Bella Dickinson, to hand Noble its first loss. 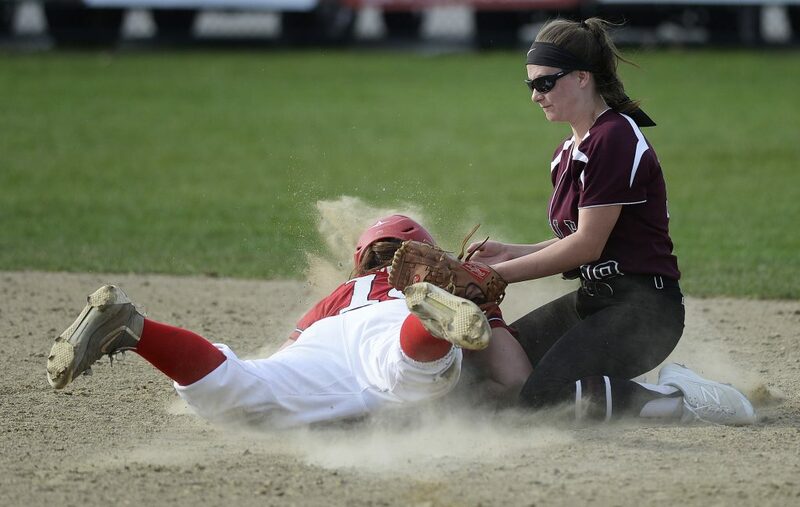 Noble’s Lauren Sanger attempts to throw out a Scarborough runner. The Red Storm scored two first inning runs when the Knights couldn’t produce a simple force out, then added two in the fourth and put it away in the sixth when Dickinson clubbed a two-run homer to cap a 6-0 victory. Scarborough improved to 6-0 and extended its regular-season winning streak to 79 games. Bella Dickinson of Scarborough delivers a pitch during her team’s 6-0 win Wednesday against Noble. Dickinson allowed only two hits, and also homered and drove in three runs. After Dickinson set the Knights down in order in the top of the first, Laura Powell drew a one-out walk off Kelly in the bottom half. Chloe Griffin followed with a ground ball to short, but Powell beat the throw to second. Hunter Greenleaf then lined an RBI single. Courtney Brochu followed with a ground ball to short, but courtesy runner Hannah Gower again beat the throw on the attempted force play while Griffin raced home from second for a 2-0 lead. Noble had a chance to answer in the second, putting runners on first and second with one out. Emily Sanfacon then lined an apparent single to right field, but Griffin raced in and threw out Sanfacon at first base for a rarely-seen 9-3 out. The Knights eventually loaded the bases, but Dickinson struck out Abbie Sprague for the third out. In the bottom of the fourth, Sam Carreiro was hit on the foot by a pitch leading off, but she shook it off and stole second, moved up to third on a wild pitch, and scored easily on a triple to right-center by Lindsey Kelley. Three batters later, Dickinson grounded a single to left to score Kelley for a 4-0 lead. 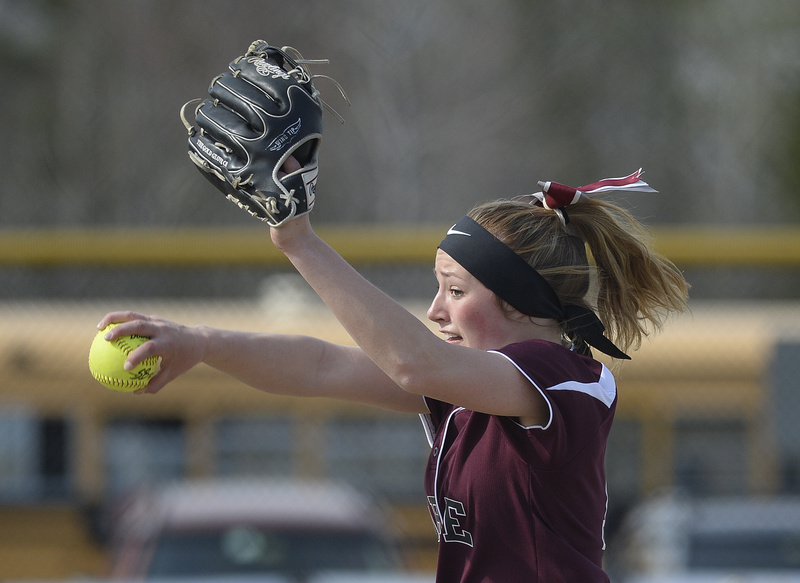 Noble’s Reagan Kelly delivers a pitch against Scarborough. Dickinson ended all doubt with two down in the sixth, ripping a home run to right-center with Felicia O’Reilly on base. Dickinson (two walks, nine strikeouts) finished off her four-hitter by fanning Sanfacon and Abby Lewis to end it. Dickinson also paced the offense with two hits, a run scored and three RBI. 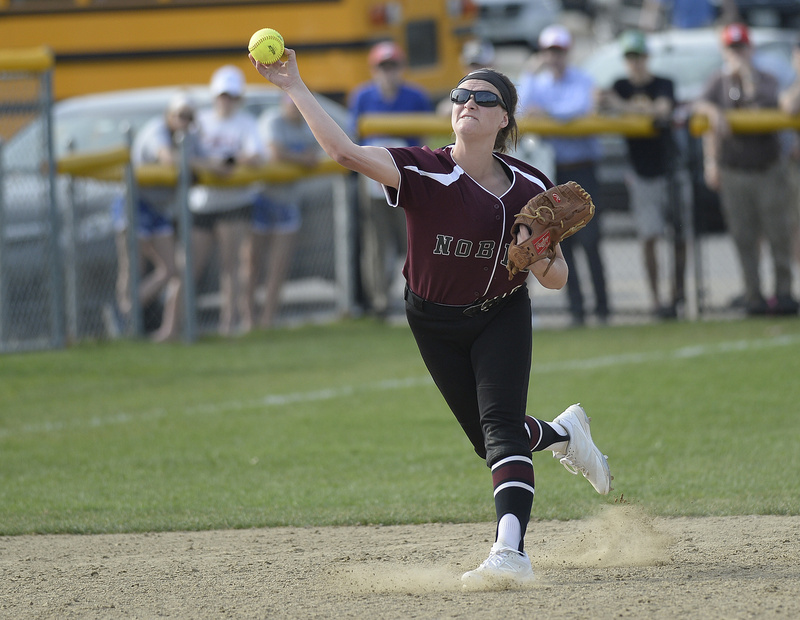 Kelly took the loss for Noble (4-1), giving up six runs on seven hits and two walks. 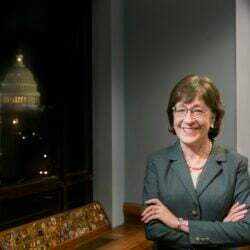 She struck out four. Jordan Boucher had two hits.